CNN recently ran a story on it’s website highlighting the ethnic Garifuna population of Belize. Photographer and writer Lebawit Lily Girma visited Belize in fall of 2012 and participated in several national holidays and celebrations including Independence Day (September 21st) and Garifuna Settlement Day (November 19th). Girma does an excellent job capturing the essence of Garifuna participation in these annual events and includes an informative narrative of the history of the Garifuna, including the top five locations you can still witness this disappearing culture in Belize. 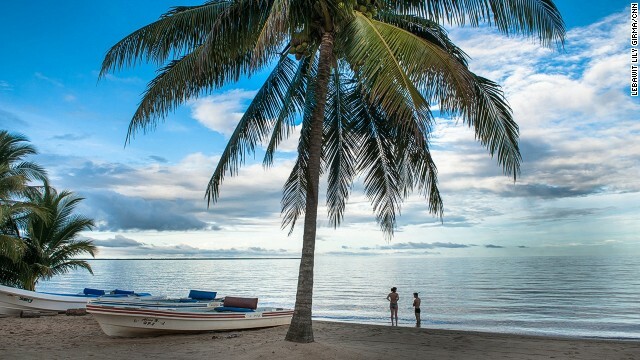 (CNN) — Drumming on the beach, moving in time with junkanu dancers and eating heaping plates of mashed plantain soaked in coconut stew — more than likely these aren’t the experiences you imagine while planning a trip to Belize. In fact, you have to venture off the newbie trail, and head to the southern Stann Creek and Toledo Districts to experience Belize’s unique Afro-Caribbean Garifuna culture. The Garifuna live along the coast, in the most scenic areas of Belize, where miles of beaches run east to south. One of the smallest groups in the country, they make up just 4% of a total population of around 325,000. The Garifuna are descendants of Carib Indians and West Africans who escaped Spanish slave ships wrecked off the coast of St. Vincent in 1635. In 1763, when the British invaded, the Garífuna were exiled to Roatán in 1798. From there, they migrated to mainland Honduras, and continued along the coast — to Guatemala, Nicaragua and arriving in Belize by dugout canoe in 1802. According to the Belize National Garífuna Council, there are an estimated 500,000 Garífuna worldwide, including large populations in the United States. About 15,000 remain in Belize, primarily in Dangriga, Hopkins, Seine Bight, Punta Gorda and Barranco. Passing through these areas, it’s difficult to tell that this culture has an endangered status. Signs of African ancestry are evident, whether in the thatched roofs of ceremonial temples, frequent echo of drums, fishing canoes dotting the sea at sunrise or girls having their hair braided under a tree on a hot afternoon. “Many of the kids are losing the language; they’re embarrassed to speak it,” says Marva Augustin, a Hopkins Village native and owner of Laruni Hati Beyabu (“Under the Moonlight”) Diner. Partially a reaction to language erosion, a community-wide effort has taken hold to preserve and share the Afro-Amerindian heritage, particularly through music, dance and food. This summer, The Garífuna Collective, seven talented musicians hailing from Belize’s Garífuna villages, toured the U.S. and Canada for the first time, winning over crowds with traditional, hip-swaying beats. “I see us as a vehicle for the next generation,” says Joshua Arana, the band’s lead drummer and one of Belize’s most respected musicians. Arana also teaches at Galen University, in western Belize. In Belize, tourism continues to creep along the coast and local towns and villages are offering more opportunities for visitor interaction. “The Garífuna culture isn’t only for the Garífuna, it’s to be shared with the world,” says Desiree Diego, a native of Dangriga and lead singer of the Garífuna Collective. Here are seven ways to take her up on the offer.